Finding Nemo is undeniably the Pixar film fans wanted a sequel to the most, and when such a treat was announced three years ago in the form of Finding Dory, focusing on the much loved Regal Tang sidekick, it was always going to be a hit from the get go. Upon release, it's quickly gained momentum across all territories and becoming the highest grossing animated film in the USA (surpassing Shrek 2 after twelve years, though this is without inflation adjustments) and also the highest earning Pixar film in China. Glowing reviews, as expected, have been awarded, and I think we can see from a mile away that this will lap up all the animated film awards at the start of next year. Normally I'd start this review with a cliché "is this all deserved" question, but the answer is likely evident. Finding Dory focuses on, well, Dory (Ellen DeGeneres) and her continuing struggles to cope with her short term memory loss and problems fitting in following her and Marlin's (Albert Brooks) quest to find his missing son Nemo (Hayden Rolence). As the film begins, glimpses of her past begin to flood her mind, revealing memories of her family and where she originally came from. Eager to act on these flashbacks and find out more about her past, she finds her journeying to the seas of California, inadvertently being capture and placed in aquarium amongst an ocean preservation institute. There begins not only Marlin and Nemo's quest to rescue her, but Dory's own exploration of her history, and realisation that being captured by said aquarium may actually be a benefit to her goals after all. Finding Dory does a nice job of connecting the story of the original with the newly devised backstory for Dory herself, thus combining them in a manner that seems fluent and legit; not like an awkward retcon with a number of contrivances. It's also refreshing that whilst Dory is the central character, Marlin and Nemo aren't awkwardly shoved to one side for the majority of the film and, in spite of some pacing issues, everything is balanced in a way that explores different locations and character plot threads in a well structured fashion. The lineup of new characters includes Kaitlin Olson as near sighted whale shark Destiny, Ty Burrell as beluga whale Bailey, and Ed O'Neill as bitter red octopus Hank, most of whom link to Dory's past in ways that are revealed as the film goes on, forming interesting yet not over the top plot twists. Each character has their own loveable personality and, much as with Marlin and Nemo, they are balanced nicely into the overall plot and so the talent of their passionate voice actors and their vivid personalities aren't wasted one bit. The animation won't have the same impact as it did with Finding Nemo, but it upholds Pixar's quality standard that we've come to expect, with beautiful rendering and fluidity both above and below the aquatic environments. It never leans too much towards excessive realism, combining i's believable textures with a vibrant artistic style that matches it's predecessor, bolstered by the technical improvements that naturally come with the past decade. 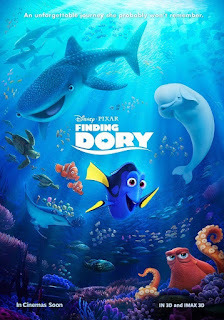 The voice cast inject plenty of life into each character, particularly DeGeneres as Dory, bringing a more emotional side to her personality that, again, combines well with her development from the original - the lineup of newcomers are also humourous and entertaining in a number of ways. Ignoring some pacing blips, Finding Dory is otherwise perfect, and undeniably close to being my favourite Pixar flick to date. The film also shows alongside Pixar's latest short Piper, telling the story of a sandpiper trying to overcome it's fear of water. This also ranks as quite possibly my favourite Pixar film in the category shorts, thanks to the stellar animation and adorable narrative.